Angus McColl served more than 24 years in the US Navy, operating and maintaining nuclear powered submarines and running training and education programs. He then began a second career in university fundraising and business development working at the University of Southern California and University of Texas at Dallas before coming to the University of North Texas. He earned a bachelor of science degree from the US Naval Academy, master’s degrees from the Naval Postgraduate School and Old Dominion University, and a certificate in fundraising management from the Lilly Family School of Philanthropy at Indiana University / Purdue University, Indianapolis. 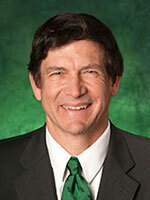 He is passionate about furthering the research and educational missions of the University of North Texas College of Engineering, and playing a role in enabling the success of its students and faculty.